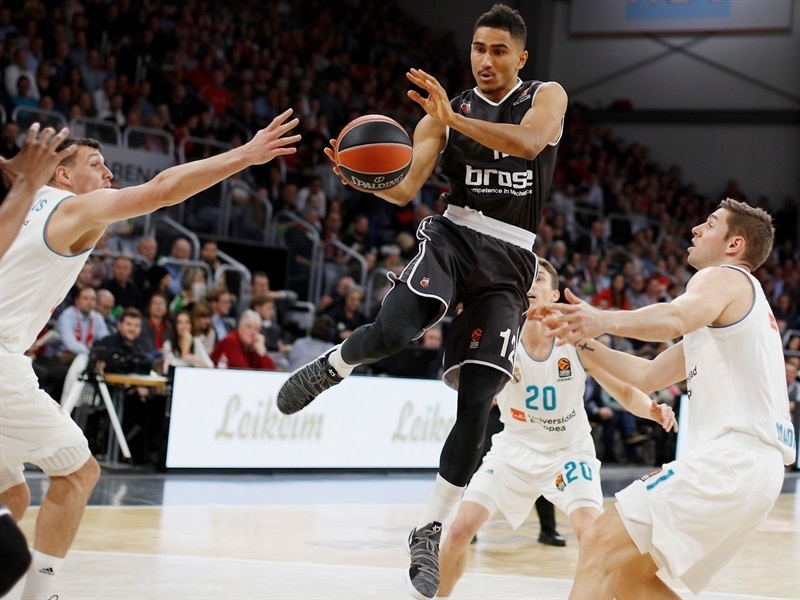 Real Madrid stormed out of the gate and never looked back as it eased to a 66-81 win at Brose Bamberg on Thursday night. 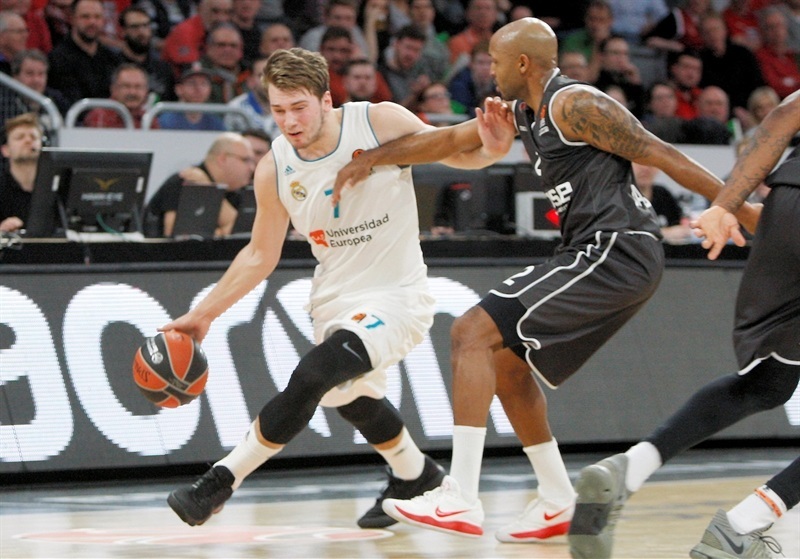 It was the third consecutive win for Madrid, which also snapped its four-game road losing streak and improved to 8-6. 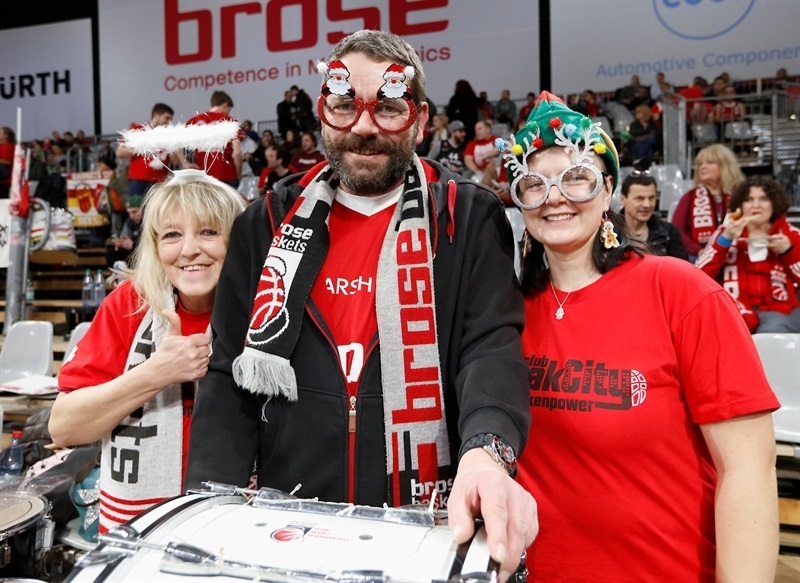 Meanwhile, Brose suffered its fourth loss in the last five games in dropping to 6-8 on the season. 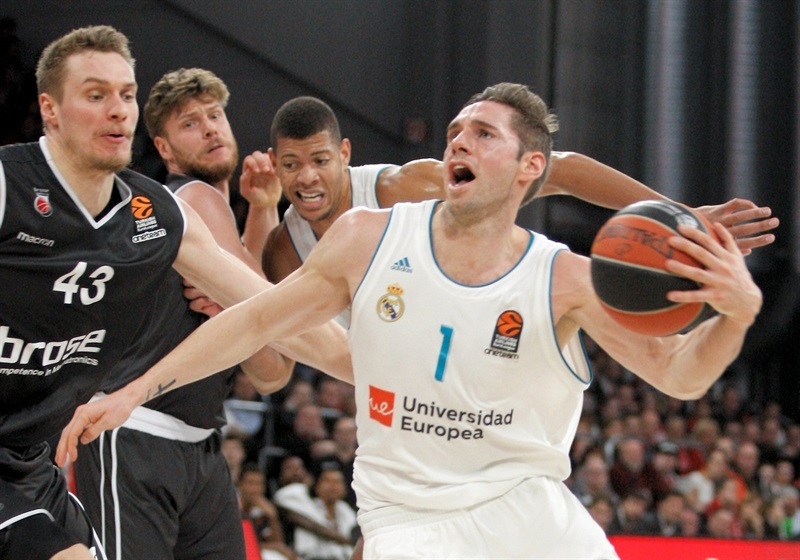 Madrid needed lees than 8 minutes and 10 consecutive points from Trey Thompkins to open a 15-point margin, and never allowed the hosts to get into single digits the rest of the way. 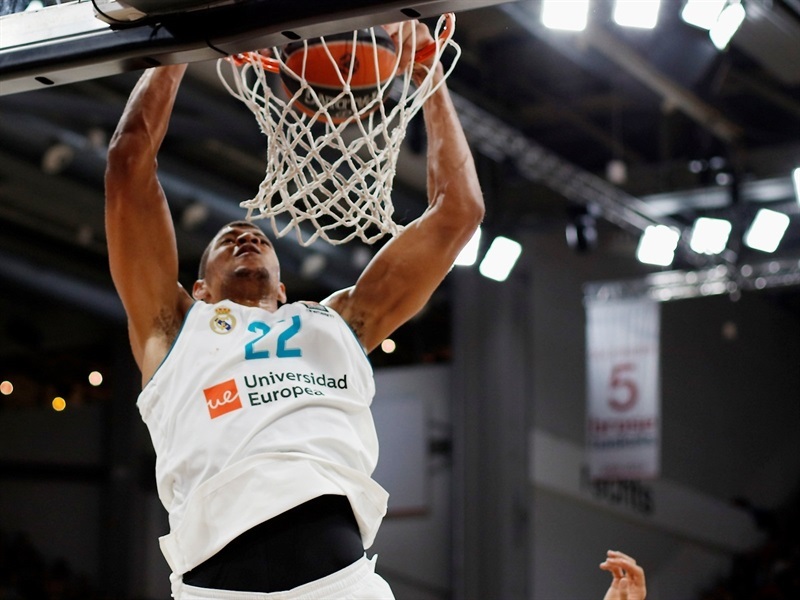 Thompkins led Madrid with 20 points and 5 rebounds, Fabien Causeur netted 13 against his former club, Felipe Reyes added 10, and Walter Tavares collected 9 points and 10 rebounds in victory. Daniel Hackett led Brose with 13 points, while Lucca Staiger and Maodo Lo had 12 apiece in the losing effort. Madrid stormed out of the gate. 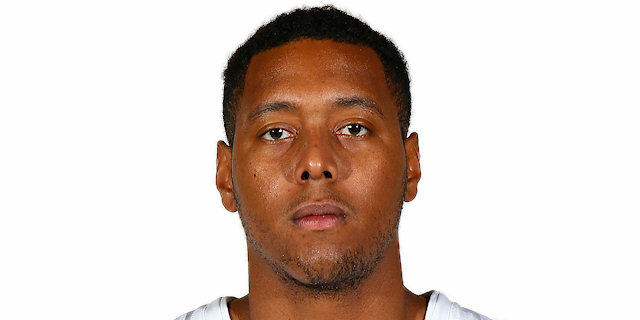 After a three-pointer from Dorell Wright, Tavares had a put-back dunk before Thompkins strung together 10 points, including a pair of triples to open a 3-14 lead. Two triples from Causeur, one apiece from each corner, extended the margin to 7-22. 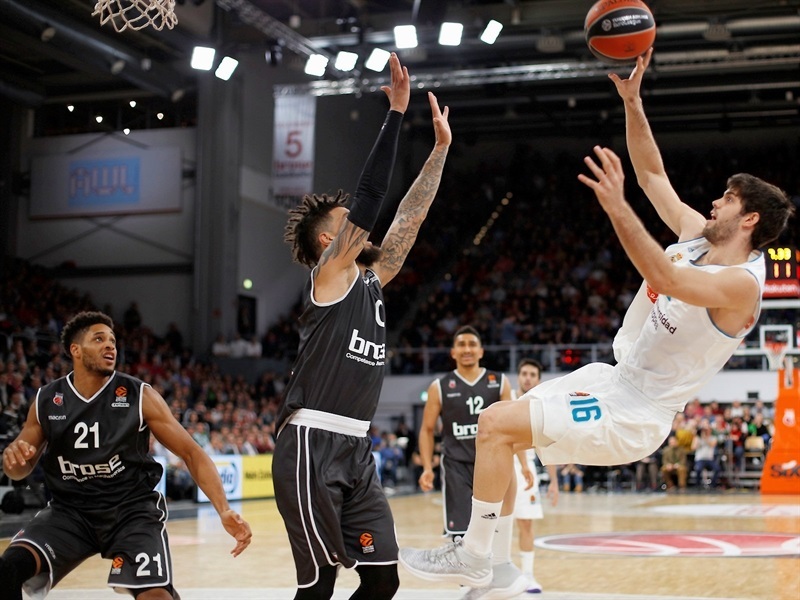 Staiger hit a couple three-pointers to get the hosts’ offense going, but Luka Doncic hit from long range and Causeur drove for a layup to make it 13-29 after 10 minutes. Hackett gave Brose an offensive boost at the start of the second quarter, hitting 3 three-pointers and getting the hosts within 22-34. 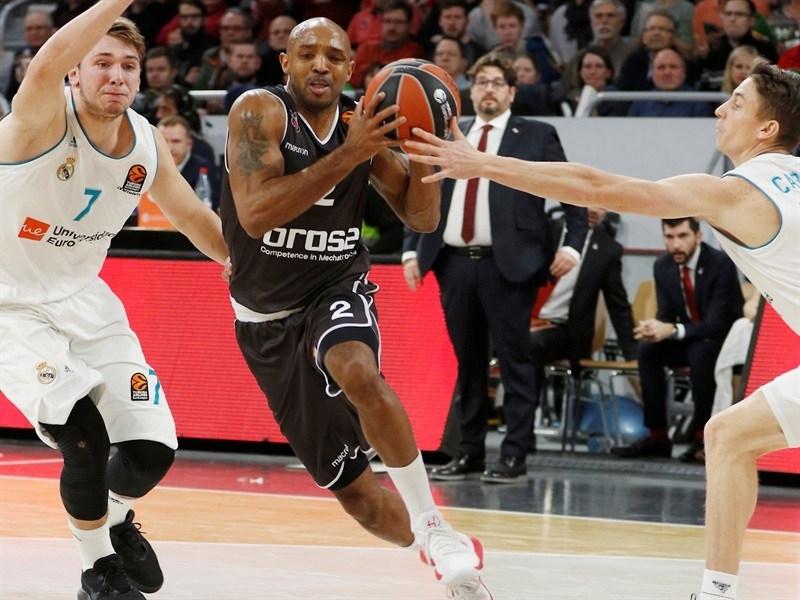 Ricky Hickman scored the next 7 points for Brose, but Madrid did not allow the margin to drop into single digits. Reyes and Jaycee Carroll had their answers ready. A jumper by Carroll opened a 17-point margin, 29-46, and Madrid proceeded into halftime up 35-50. 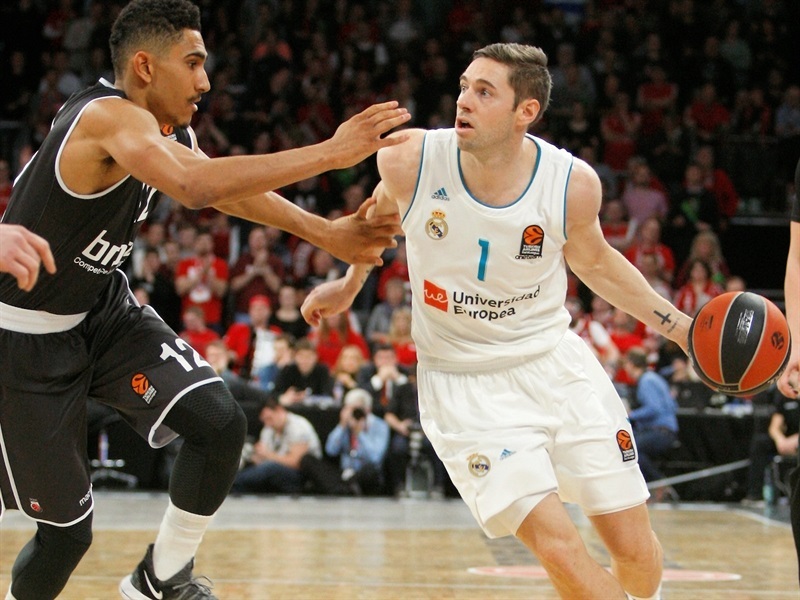 Lo and Thompkins traded triples to start the second half, before Santiago Yusta from close range, and Causeur from long range opened a 42-60 lead. Lo and Augustine Rubit scored from the paint for the hosts, but so did Tavares – twice – before Thompkins muscled his way inside to help make it 46-68. Before the end of the quarter Staiger nailed a triple and Radosevic soared for a dunk, only for Staiger to hit from long range early in the fourth quarter, too, making it 56-70. 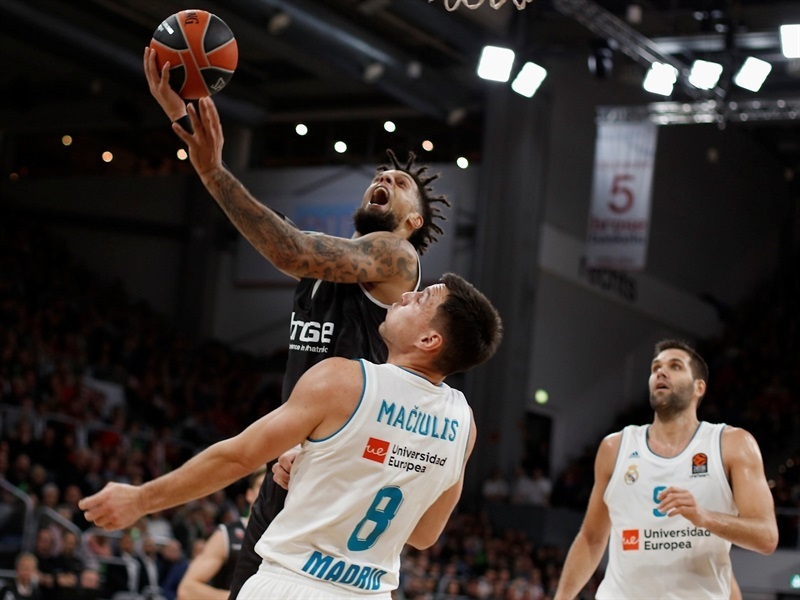 But Thompkins answered with a three-point play, and despite a triple from Rubit and a jumper from Hackett, Madrid kept the hosts at bay, and continued cruising the rest of the way. "We played a bad game. It is one of the few times that my team did not fight, and that’s bad. If you allow yourself to think you are tired, you are going to be tired. It is very simple. Everybody is tired. 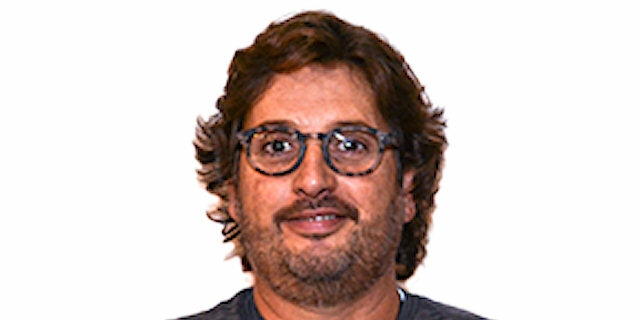 I believe we lost the game in the first four minutes, when we did not play defense, we did not play offense. We have to focus all our energy at the beginning to try to set the tone of the game. We did not do that. We were extremely bad on defense, not smart on offense, and that cost us the game. I believe that tonight we were bad, and the fans don’t deserve these kind of games. We had to try. 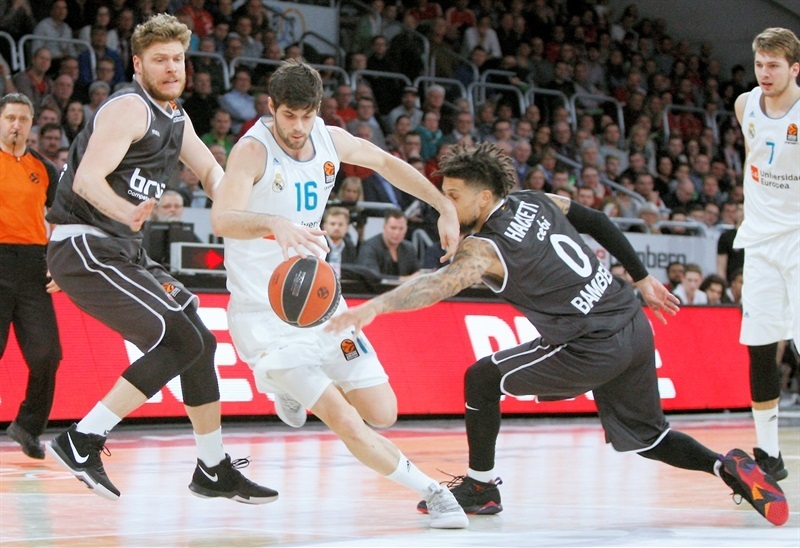 Maybe we won’t be good enough to beat Madrid, and of course the game in Kaunas cost us a lot because we played a great game, but the story is we have to learn quick how to regenerate ourselves and play the second game better. That’s the point. If you allow yourself to think you are tired, you are going to be dead tired. So excuses and explanations are for losers. Everybody’s tired and you have to find a way to manage it." "For me there were two key moments of the game. It was the beginning, when we started very concentrated. We played very smart defensively, and we did not let them get their rhythm. We were able to rebound and control the rhythm of the game so we got a good advantage in the first quarter. 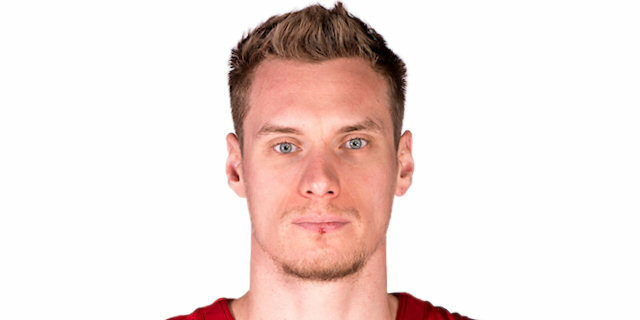 After that we knew that Brose is a team that always fights to come back. We saw the games against Barcelona, Olympiacos and Valencia. So, we knew that we had nothing done, and we are supposed to keep fighting the same way for 40 minutes. We did it. It was also very important our exit out of the halftime, when we controlled the same situations that we did in the first half, and finally we got a good win away from Madrid." "We did not start good. That was the main thing. We started very bad the first five minutes, and then we were chasing a 15-point difference. When you have this kind of week, it is hard to catch them at the end. If we were fresher maybe we would have a better chance to catch up to them. We should not have allowed them to start the game so easy." "Defense and rebounding were the keys for our win tonight. This is a tough team here on their home court. We did a great job of staying together and communicating on defense and getting stops. We had a tough week, but coach told us it will take everything we have to win here, and as a team we can do anything. So we did it."